Series Four of Friends contains such gems as The One Where Ross Says Rachel, and The One Where Chandler Is Shut In A Box. The unforgettable Series Five is bookended with weddings and travels from London to Las Vegas. 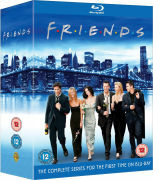 Episodes include The One With Chandler’s Fake Work Laugh and The One Where They All Find Out About Monica and Chandler. Changing room-mates and new romances are just some of the things that made Series 6 one of Friends’ most delightful and endearing. Series 4-7 feature these special guest stars: Charlton Heston, Jennifer Saunders, Sarah Ferguson, Teri Garr, Bruce Willis, Reese Witherspoon, Tom Selleck, Elle Macpherson and Ralph Lauren. I love this and would surely recommend it. Great value for money!